Students in Assistant Professor Jodi Mather’s Digital Marketing class are getting some hands-on search engine marketing experience this semester thanks to a Google-sponsored program that pairs college students with non-profits. Mather, who is teaching an Early College High School class full of students on the Entrepreneurship track, discovered the Google AdGrants Marketing Challenge last year and thought it would be a good challenge for her digital marketing students. “Through this program, non-profits are provided with $10,000 a month in advertising and they pair up with college student teams to create strategies and set goals for the campaigns. Google sets up guidelines and metrics for them to follow and they are held to a pretty high standard – they have to hit certain quality standards or they get dropped from the program,” she said. Mather said she hopes to continue offering this opportunity in her classes in upcoming semesters, and for his part, Sweet said the experience is really invaluable for these young students. 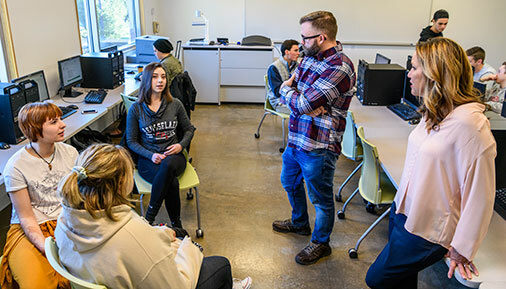 “It’s important for students who are interested in marketing to see that this is where a lot of the field is going,” he said. The students are part of the Clean Technologies and Sustainable Industries Early College High School, a partnership with the Ballston Spa Central School District, which is designed to develop pathways to higher education in four fields: renewable energy, entrepreneurship, computer information science and semiconductor manufacturing. Students from two dozen school districts around the region Students take courses at TEC-SMART for half the day and finish up with regular high school courses in their schools for the remainder of the day.